Dundee Football got their first point of the 17/18 season against Hibernian at Dens Park on 27th August. It was also a historic game as the club's first LGBT fan group unfurled their banner for the first time. The group was founded by fans Bradley Booth and Michael Craig. Bradley says they were inspired by the recent documentary by Gareth Thomas and took inspiration from the many fans groups which have been established south of the border. The group started with just the two, but they've had quite a few new members sign up in the build up to the match. 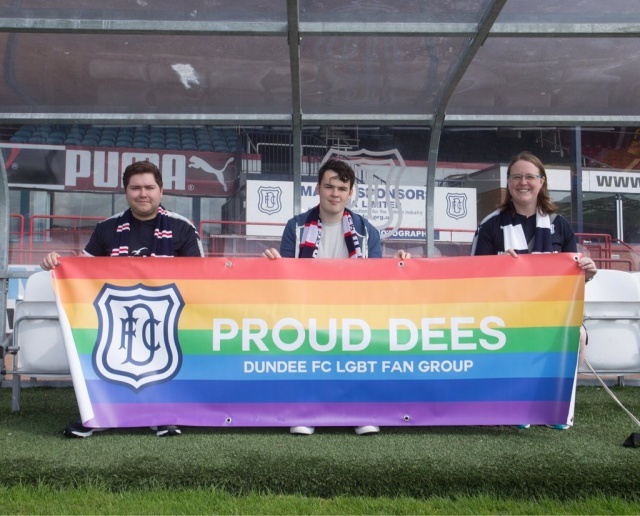 Proud Dees has the support and backing of Dundee football club and have been working with Supporters Liaison Officer John Burke. Prior to the match they had a formal photo call with club officials and the club photographer. The group has also faced some criticism via social media. Bradley told us: "We're not trying to be different or separate but if you’re an LGBT football fan, you notice and you hear the abuse. The group will help to point out that there is an issue that needs addressed, and will help support the club to point in a positive direction". The first LGBT fans group in Scotland launched in 2015 as the Proud Dons established at Aberdeen. A Tynecastle Pride group is also already established. A House of Commons Inquiry report from earlier this year acknowledged that homophobia remained a problem in sport and that football had particularly significant issues. The report also recognised the important contribution that LGBT fans groups were making towards addressing this. Written on 27th August 2017.